It's fast and easy to create a contact in ContactPigeon. 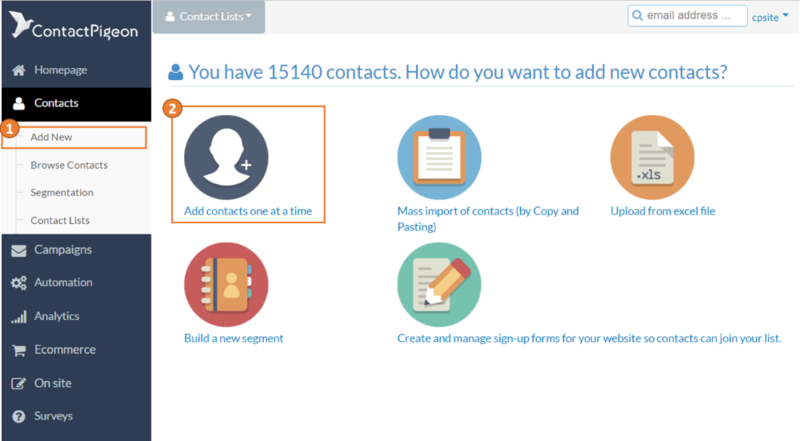 You can start by directly entering contact information individually within the platform or use one of the mass upload options to create contacts in bulk. In this article, you will learn the step by step process of how to create a single contact. Step 1. From the left side menu options, select Contacts > Add New. Click on "Add contacts one at a time". Step 2. Enter contact details in the Contact form. Step 3. Define and update custom data fields. Date - Captures any date fields related to customers (e.g., Birthday, Anniversary, etc.) Go to the "Important Dates" tab to start customizing date fields. Text - Captures any customer details in text format. Go to the "Custom Fields" tab to custom text fields. Numeric - A numeric field can be an integer or decimal for assigning values (e.g., Age, T-shirt size). Go to the "Custom Fields" tab to customize numeric fields. In order to change the label of the custom field. Double click on the label to start editing the label text. Press Enter when complete, and the label change will be updated. As default, you start with 5 custom Date and Text fields respectively. To add additional fields, please go to "Your Account" in your "Profile" section, see Manage Custom Fields. Step 4. To add a contact to a specific list, click on the " Lists to which it belongs" tab, and check the list to which the contact will be associated with. Step 5. Remember to "Save Changes". This saves the new contact.